LG is reportedly planning to begin selling big screen TVs that can be rolled up and set away like a poster in 2019 in an effort to revive an ailing business. LG exhibited an OLED TV that rolls up in a box at the CES 2018. The reasonable advantage of this TV design is that when not being used there is no huge black box on your wall. The LG OLED TV can be hidden like you can hide a roll-up projector screen. 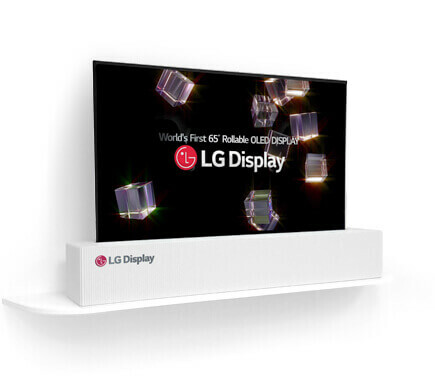 LG as of now offers different physical designs of its OLED TV line. The roll-up version gives consumers one more choice on how they can integrate a giant premium TV in their home. Bloomberg's Min Jeong Lee and Sam Kim wrote revealed that LG is making the prototype available as a real product for consumers starting next year. “LG Electronics Inc. plans to begin selling big-screen TVs next year that can be rolled up and put away like a poster,” Min Jeong Lee and Sam Kim wrote. The rollable LG OLED TV is supposed to be released in 2019, as indicated by a Bloomberg report. LG has not made any declarations yet. CES 2019 is the ideal time to make that declaration. The LG rollable TVs could be more energizing than 8K TVs that will be a major theme, yet with no incentive insofar as there is no 8K content. The 65-inch TV can retract automatically with only a touch of a button. It will likewise feature organic light-emitting diode or OLED screen that can deliver crisper pictures and fold more effortlessly compared with traditional LCD panels. A prototype of this advanced TV is shown at LG's research center in Seoul. It can be rolled up and stuffed into a box when not in use. CES 2019 will run January 8-11, 2019, in Las Vegas, Nevada. The show is the world's biggest and most persuasive technology event, including 4,500 exhibitors crosswise over 2.75 million net square feet of display space. The most smoking trends of CES 2019 incorporate 5G connectivity, artificial intelligence, augmented and virtual reality, mobility, smart home, smart cities, sports tech, machine learning and more.